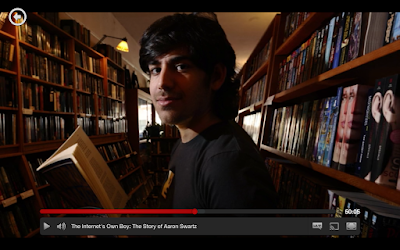 I'm studying this Amazing Guy (Aaron Swartz for your works on self learning) to make a video about Swadhyaya. Swadhyaya is a principle of the Yoga that means - Self-Study. I wanna explain the Self Study has two sides. One kind of study is self analysis about your behavior and the things in it that you wanna change. This is a very important point for who want to express your Self better. But this kind of process have a big fail. To improve things, doesn't matter if it is your alimentation program or the quality of your sleep time, is much better if you can mensure the improvements. So even if you work with it everyday, like me, its hard to say "in September 2012 i was better in mine self observation than now." So one way to see if everything is being well is use the other side of self study - the self learning. The capacity to learn different things or skills (in this case on the internet). I believe that we can learn everything. Of course, some people have facility in some areas and other in others, but in the end of the day if you dedicated time in what you want to do you will learn, and will be good if you want so much. To talk about Aaron Swartz he was a bright developer because he started program very soon. But he study a lot of things and even gave up the School, he was call from Harvard to participated of some programs to develop the biggest leader of next generation. In my opinion, to complete the Swadhyaya we have to join the self study whit self learning. The first keep us curious about what is important in our lifes and them what is important to learn to get what we realized the is important. The self learning also depend of the self observation, because always when you go to learn something new, your brain try to convince you that this is not necessary, this isn't to you, this is a waste of time. And if before you didn't realize that this skill is really important to you, when you begin the learning you will give up very early. In the other way, self learning is a tool to mensure your improve in self study. Get both together, if you can't - practice more Swadhyaya and try again and again - it's just about the time.